Another spider's web, this time in black and white. The spiders must all have been out shopping or something when I took this. I didn't see any spiders in any of their webs that morning. 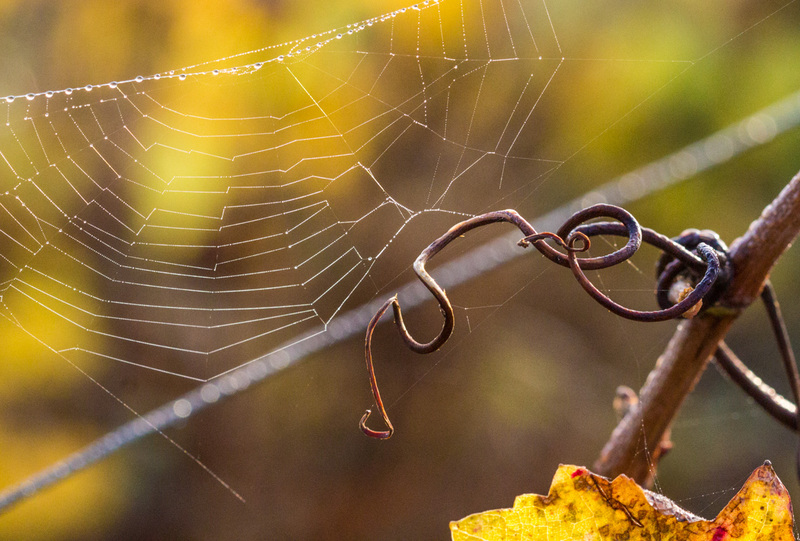 The web is visible thanks to what probably amounts to thousands of tiny dew droplets. I brought in the winter squash yesterday. I counted two potimarrons (we've already eaten two others), four butternut, and fifteen acorn squash. I see many squash dishes, sweet and savory, in our immediate future. I made pumpkin pie for Thanksgiving dessert. I didn't dress it up with whipped cream, although that would certainly be good. My standard pie filling does not come out of a can, but is home-made with pumpkin that I grow and roast myself. This year's pumpkin is actually a potimarron or red kuri squash. Its flesh is firm with a pronounced chestnut flavor, and it's not quite as sweet as a standard pie pumpkin. A slice of pumpkin pie. When I make the filling, I use a traditional recipe but I cut down on the amount of sugar and spices. This lets the flavor of the squash come through. There is still plenty of cinnamon, nutmeg, ginger, cardamon, and clove, along with some fresh lemon zest, whole eggs and cream. I think it's very tasty. 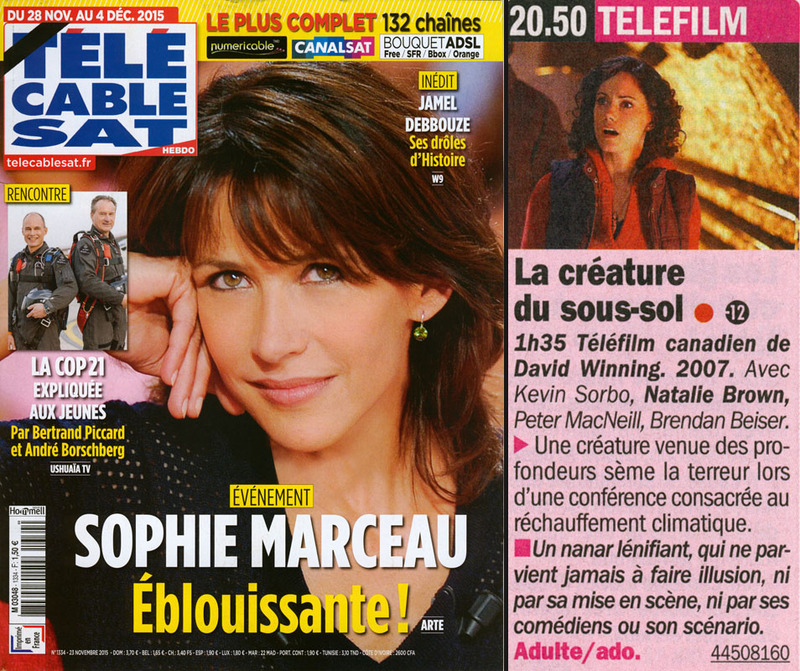 This week we see a very famous French actress, Sophie Marceau, in a role written by Bergman back in 1972. Apparently she did this as a play before starring in it as a television movie. Marceau became famous in 1980 when she starred in "La Boum" at the tender age of thirteen. The climate conference, COP21, is taking place this week in Paris. I hope they don't watch this week's bad movie! This week's bad movie is from Canada. It's original title is "Something Beneath." I was going to translate the French title as "The Creature from the Basement," but given the actual title, I think the word sous-sol, often used to mean "basement," is better interpreted as "underground." La créature du sous-sol (The Creature from Underground). Canadian made-for-tv movie directed by David Winning, 2007. With Kevin Sorbo, Natalie Brown, Peter MacNeill, and Brendan Beiser. ► A creature from the depths of the earth terrorizes a climate change conference. A bland bomb that never convinces, from the direction to the actors to the plot. Well, it's done. The installer finished the job by mid-afternoon and another technician came by to get us up and running, program the thermostatic controls, and walk us through how it all works. The boiler is working well (so far) and is quieter than the old one, which used to make a loud whoosh! sound when it started up. I can't hear the new one start up at all. The new boiler, installed. All the cardboard boxes and tools are gone (compare with yesterday's photo). The thermostat control is a little box that you can move around the house depending on where you want it. It has a little display screen with time, temperature, and other indications. Right now we have it in the main living/dining room and I suspect that's where it will stay. We set up an initial program (with the technician's help) for a day temperature and an overnight temperature. The switching points are at 5:30 in the morning and 10:00 at night, respectively. I've already made adjustments. This morning I woke around 4:00 and heard a low hum which turned out to be the boiler working (it's two floors below the bedroom). I got up to check and, sure enough, it was running and the radiators were heating up. I couldn't go back to sleep wondering why it was running an hour and half early, so I stayed up and read the manual. 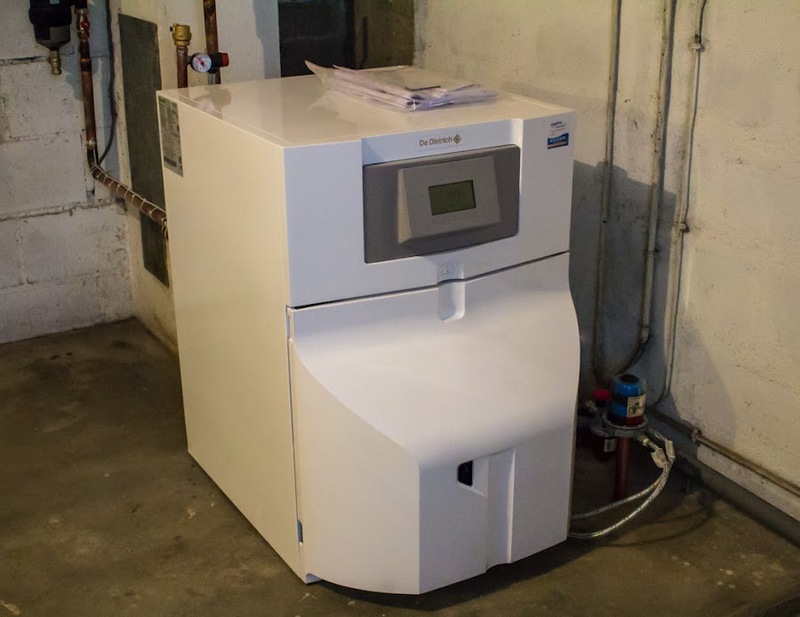 It turns out that the boiler starts up before your programmed hour and gradually brings the room up to temperature so that it's at the right temperature at the right time. Well, now that I know that, I can set the daytime temperature for a little later in the morning. I also set a lower evening temperature and a new overnight schedule. I don't like the house too warm when I sleep. We'll see how it works and will probably make further adjustments in the coming days. We're holding our Thanksgiving dinner (roast leg of lamb) for Friday due to the ongoing replacement of the central heating system boiler. The old one was decommissioned yesterday and removed. The new one is in the process of being installed. Work should finish up sometime during the day today. The old boiler, disconnected and ready to be wheeled out. Every cardboard box you see in this photo, every single one, contains parts for the new system. When I took this photo, the new boiler itself was still on the truck. Meanwhile, the wood stove in the living room is working to provide us heat. Thankfully (hey, today's the day to be thankful!) the weather turned from cold to mild and we're not at all uncomfortable. We're keeping our fingers crossed that everything works as expected and we will be using the new boiler later today. Ken is posting some "before" photos on his blog today. One or both of us will post "after" photos when it's done. We're waiting this morning for the guys to arrive with the new boiler. If they arrive; we haven't heard from them at all since they scheduled the appointment. I don't know if we're supposed to be using the heat this morning or not. They didn't say and I didn't think to ask two weeks ago. The system will have to be emptied of water (which will be hot) before they can remove the old boiler. Lots of questions, as yet no answers. I took this photo almost three weeks ago. There are many fewer leaves on the trees now. Callie had a good vet visit yesterday, although the joint was jumpin'. Lots of people, lots of animules, but Callie was well behaved. She got her shots and some medicine for fleas. There's a variety of flea that seems to be resistant to the Frontline we give her every month. They have taken up residence in her fur. Ick. So she'll be rid of them in a day or two. Already this morning she's hardly scratching, so they're dying off. Good riddance! UPDATE: They arrived. The old boiler is off-line and dismantled already. Of course I had to photograph the carnage. Fortunately, there was no blood. The mouse had not gnawed into anything that I could see, but his/her "leavings" were obvious. It had burrowed into the sandy floor and was digging tunnels under the dog's kibble bin. It would only be a matter of time until it started nibbling on potatoes or ripping into plastic bags of rice and pasta. 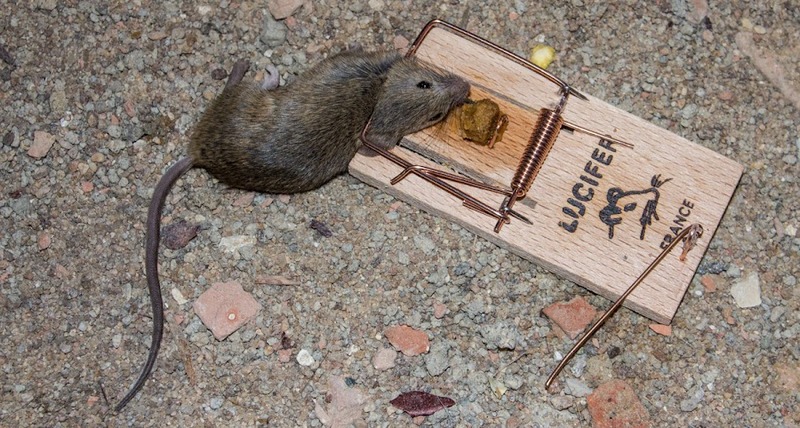 I baited three traps with peanut butter and waited. A few days later, we found that one of the "snap" traps had worked. Poor thing. I've kept the traps down there in case there are other mice, but it's been more than a couple of weeks and there is no sign of another. The last leaf. Well, probably not, but most of the vineyard leaves are gone. Now that the temperatures are dropping to more seasonable levels, those trees still hanging on to their golden leaves will shed them quickly. I'm back to building daily fires in the wood stove. It's fun now, but I know it will become a chore as we move through winter. I've got to get some new photos taken. 100mm (macro), f/8.0, 1/320s, ISO 4000. 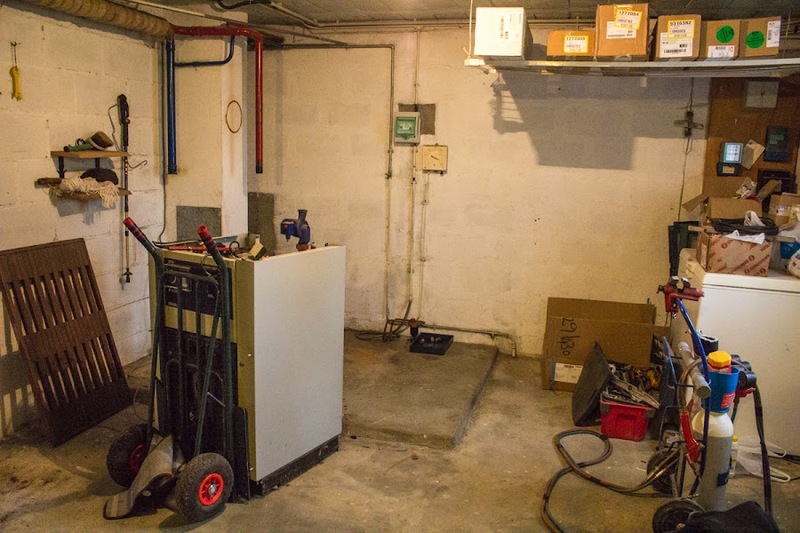 This week we are scheduled to get the old boiler replaced. The plan was to have it done before the cold weather set in. That's why we placed the order in July. But production delays, obeying Mr. Murphy's law (or Sod's law, if you're British), had us wait until now. 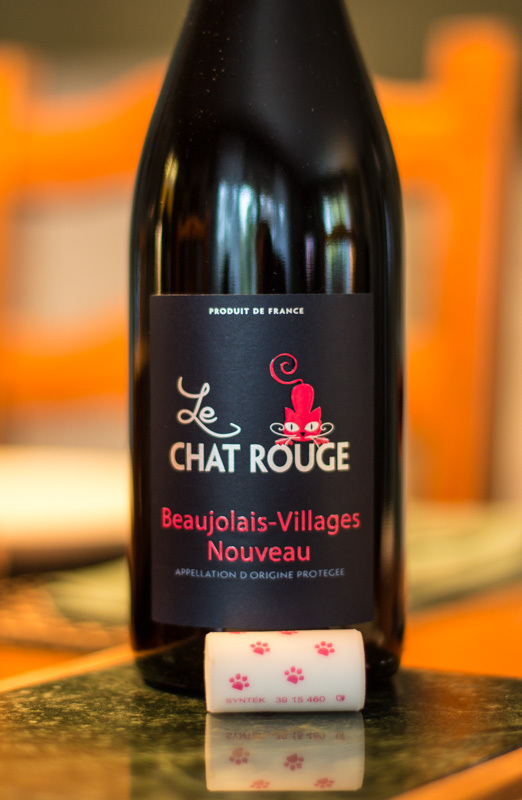 I checked back through the blog and saw that 2011 was the first time we had Beaujolais nouveau from Le Chat Rouge. The next time I mentioned it was 2013. Now, after another two years, we have it again. I see that they've changed their logo (look here to see what it looked like two years ago). We've had three bottles of nouveau so far this year. If I hadn't known that it was "new wine," I wouldn't have guessed it. It tastes just like normal gamay. I like the little paw prints on the cork (which is not cork, but a plastic closure). Our outdoor thermometer shows 1ºC (about 33ºF) this morning at 7:00. That's our coldest low so far this season and the coldest since early March. Fall is transitioning into winter. Well, speaking of the weather! Just as our weather turns from mild to wintry, we have the Paris climate summit coming up, and various television weather presenters are being interviewed about climate change. 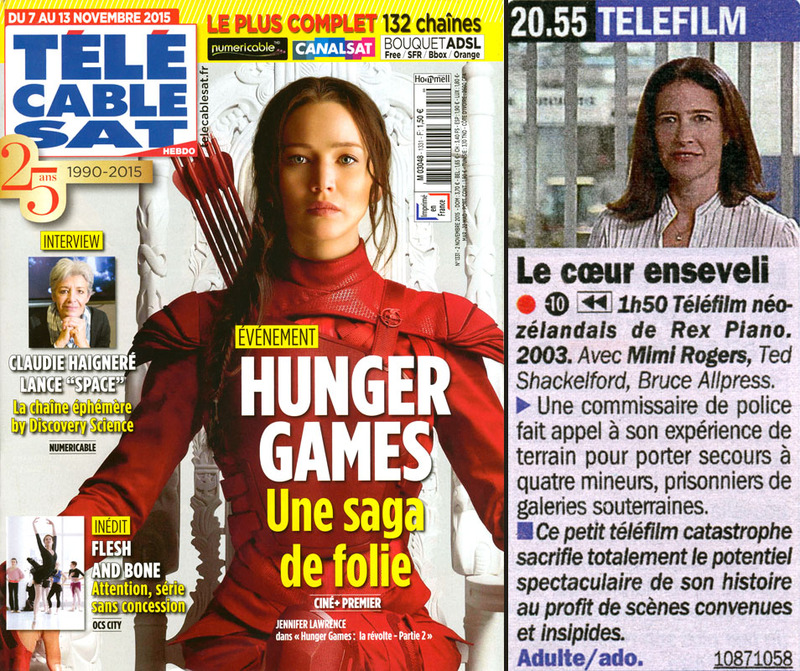 The woman on this week's cover, Evelyne Dhéliat, is one we see often. We used to see a lot more of Laurent Romejko when he was on France 2, but he's moved over to France 3 and we don't watch weather on that channel much. Leo DiCaprio is among the more ecologically-minded movie stars. A French stinker! 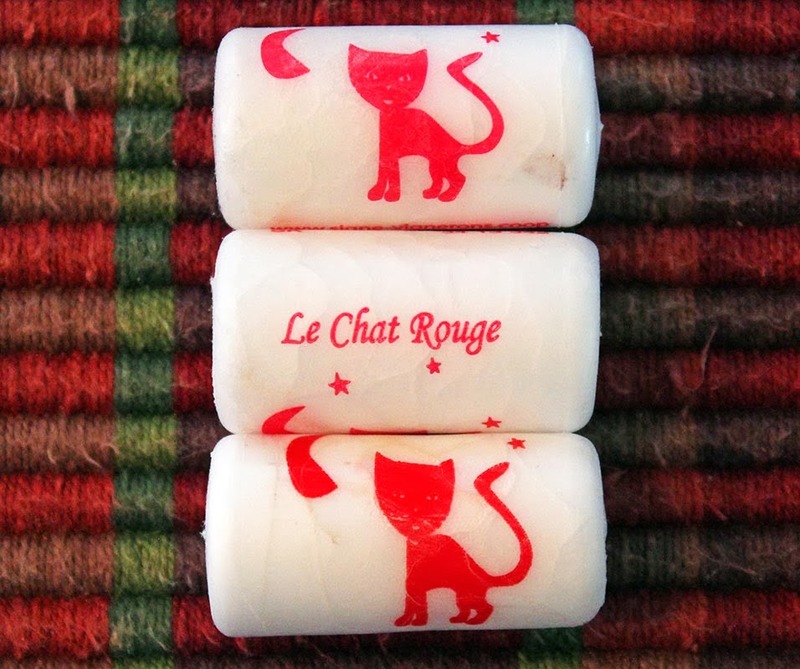 Lest you think our editors are chauvinistic, they will pan French films when appropriate. I think this one may have been featured here before, but it's the only red-dot program I could find this week. Frère et sœur (Brother and Sister). 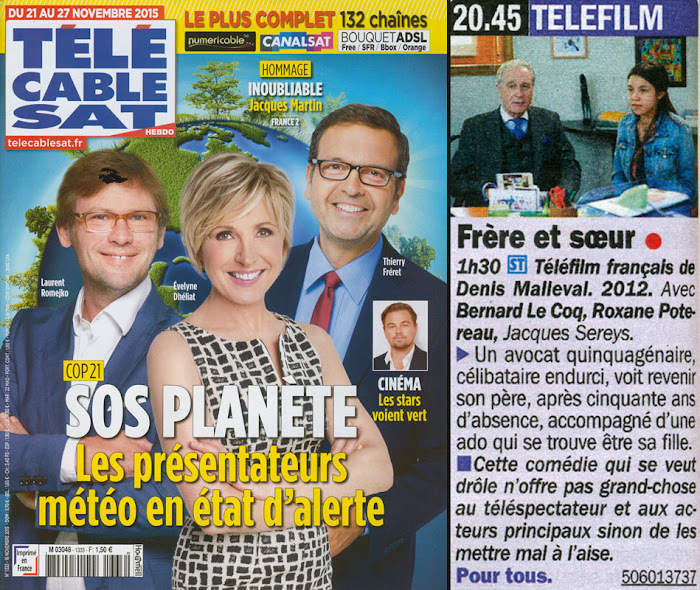 French made-for-tv movie directed by Denis Malleval. ► A fifty-something lawyer and confirmed bachelor sees his father return after being gone for fifty years. He's accompanied by a young woman who turns out to be his daughter. This comedy thinks it's funny, but there's not much on offer for neither the viewers nor the actors, except to make them uneasy. The bloom is off the rose. At least this one. 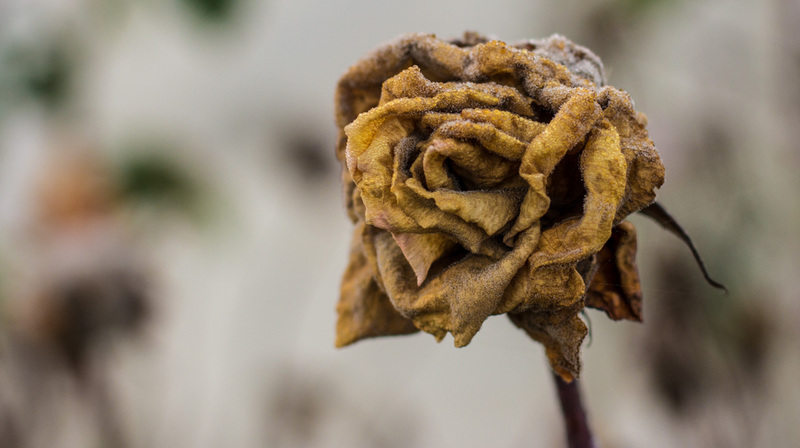 Its petals still cling to the stem, but they have shriveled and turned brown. It's still kind of pretty, though. 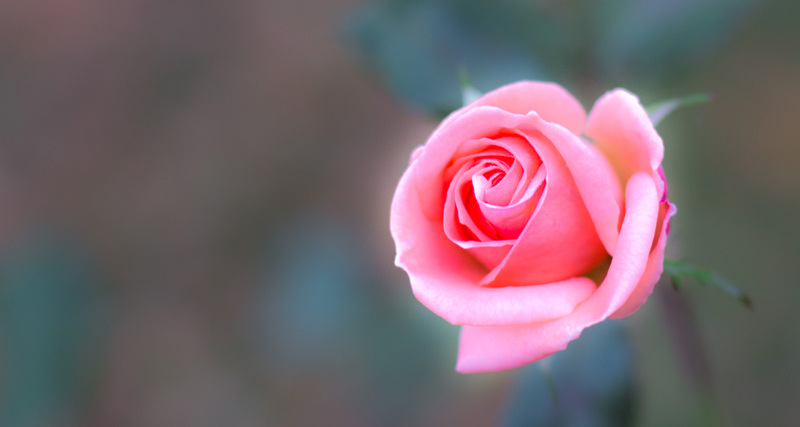 A rose was a rose, 50mm, f/3.5, 1/160s, ISO 200. The predicted weather system is moving through. We're are on the southern edge, but the wind is whipping through and we're having rain squalls. Then we're expecting a serious drop in temperatures to near freezing by Saturday morning. Brrr! Today is the day that the Beaujolais Nouveau is released. It's not such a big event as when the marketing geniuses thought to publicize the tradition back in the early eighties, but still, it marks the first release of this year's vintage. The hot and dry summer we had hints at good things to come. We shall see. This is not Beaujolais; I don't even think these are wine grapes. 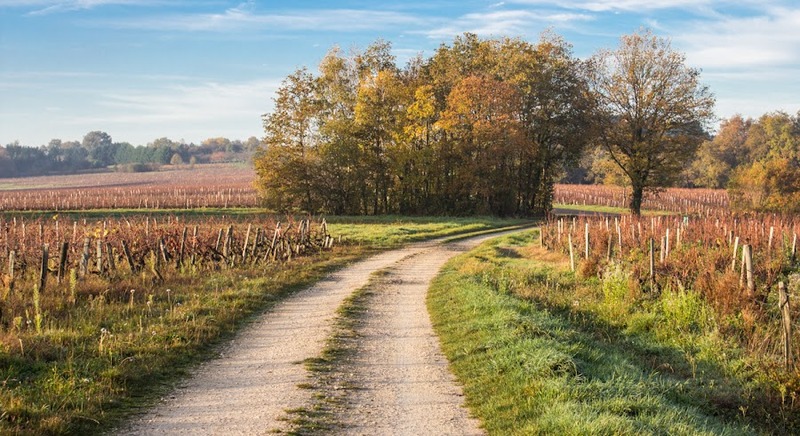 The Touraine region, where we live, also has a "new wine" tradition that dates back quite a while. The local Touraine Primeur is also released today. We will be able to buy it in our local supermarkets (and at wineries, of course) over the course of the next month. 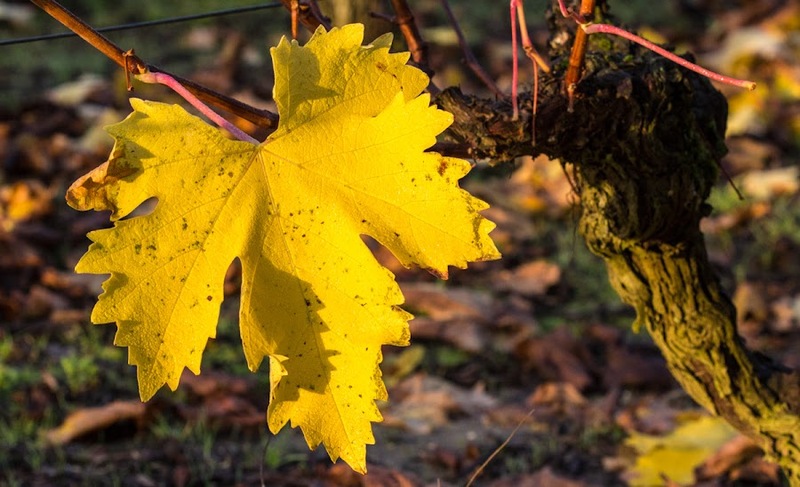 New wine isn't necessarily good wine, not having benefited from proper aging, but it can be tasty and can give you a preview of the vintage's qualities. I'm looking forward to our first bottle! Or "tender tendrils?" I couldn't decide. The brown one has clearly wrapped itself around the green one. Different stokes for different folks (and scooby dooby dooby). Now I've got Frankie Valli and Sly and the Family Stone in my head. Can you see all the little spiders' webs strung between the tendrils? Ken's plane landed a little early on Tuesday morning and he made his train with no difficulty. Except that there was an incident in a station the train had to pass through that slowed them down, so he ended up a half-hour late. But that wasn't a problem. Callie was all excited when she saw him. I'm sure she had given up on him. Bertie was, like, "Oh, it's you," and yawned. I mentioned recently how the vineyard workers are replacing older, diseased vines in the vineyard parcels with new ones. The new vines are tiny, about six inches high. 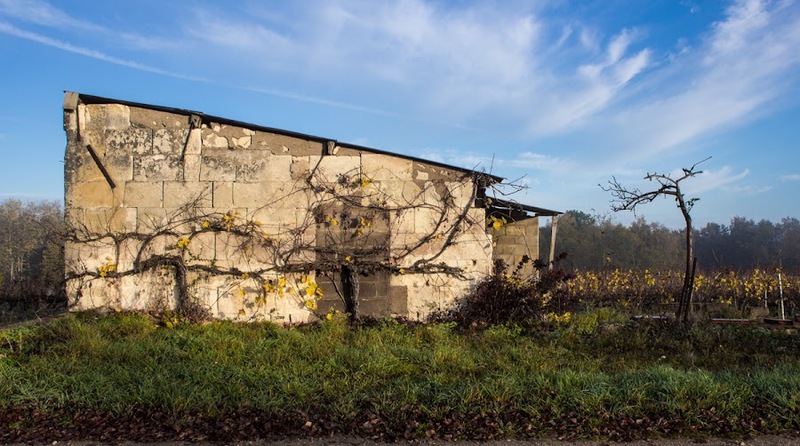 They are, like most grape vines in France, grafted vines, meaning that the root stock is one variety that is resistant to the scourge of phylloxera, and the growing vine above it is a traditional French varietal, either sauvignon (blanc), or cabernet, côt, or gamay (rouge). Sleeves around new vines are held in place by thin metal stakes in the ground that hook over the lower support wires. 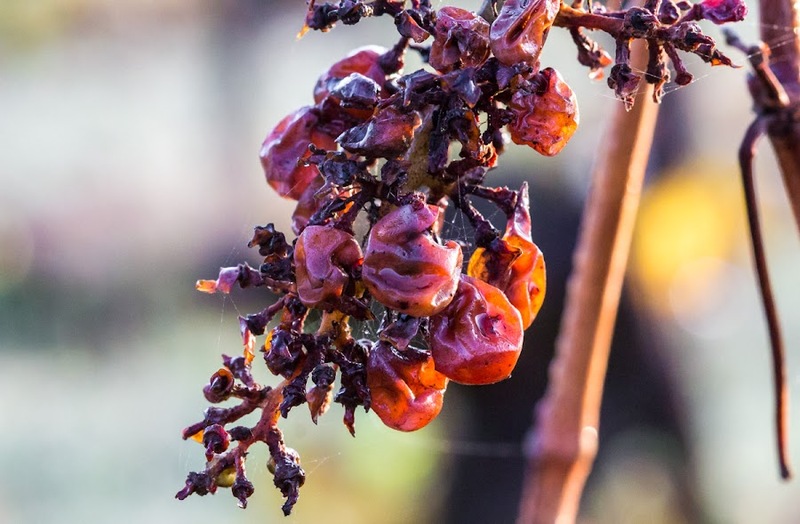 The new vines have what looks like a red waxy coating on them which dissolves away as the vine grows. I should have taken a photo of that, but I didn't. 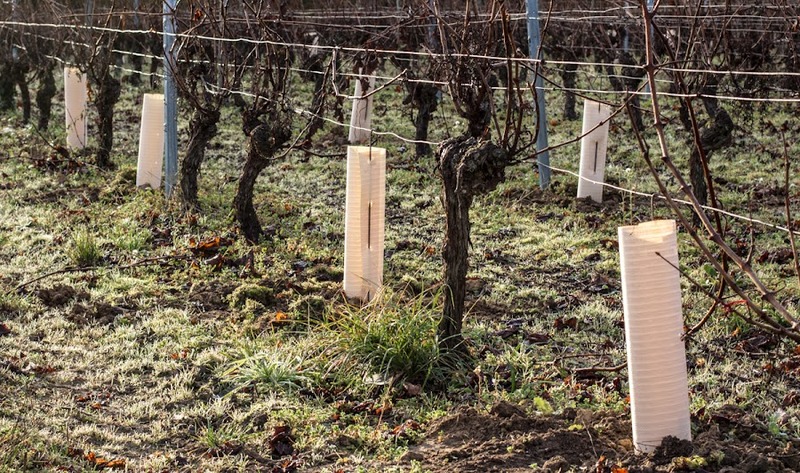 To protect the new vines from hungry animals and cold weather, they are planted inside a foot-high sleeve. The sleeves will stay on for a year or so. Next spring, as the vines start to leaf out and produce tendrils, they'll poke above the sleeves, reaching for light. I'm happy to see growers investing in their vineyards, especially the ones around us. I have all these autumn leaf photos, but most of the leaves have dropped at this point. So, they're not really representative of what things look like now that it's mid-November. I'll "leaf" you with this one for now. 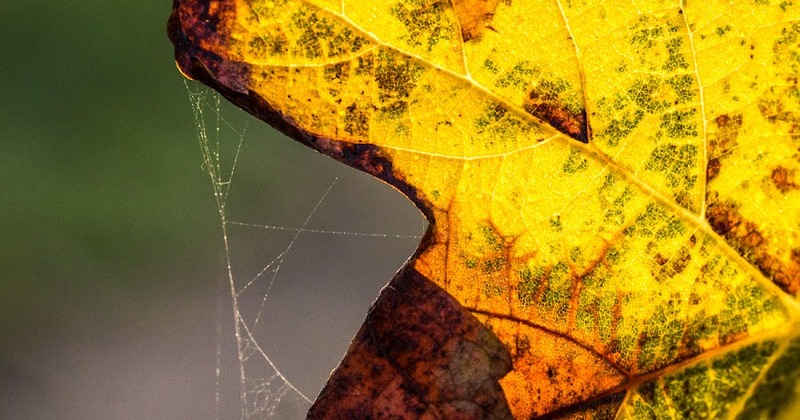 Spider silk on a grape leaf. 100mm (macro), f/6.3, 1/320s, ISO 1600. The outdoor temperatures have been just on the edge of chilly. The far edge. The edge that separates chilly from cold. So the past two days (and probably today as well) I've had a fire in the wood stove during the afternoons and evenings. They're the first fires I've had since our little cold spell in mid-October. And now, well, Thanksgiving is next week! We will have plenty to be thankful for, once Ken gets home safe and sound. He leaves the US later today and arrives back in France early Tuesday morning. All flights (and trains) are running on schedule, but we fear that the lines at the immigration checkpoints have slowed down as security has been beefed up. That means that there's a possibility that Ken will miss his train out of the airport and will have to make other arrangements. We're in touch with one another, of course, and have worked out what to do, le cas échéant (just in case). Let's hope by Tuesday morning that they've increased the number of immigration agents at the airport and that things go relatively smoothly for Ken. One of our rose bushes is covered in flowers right now. It has no leaves, they've all fallen. But the flowers are pretty. A soft focus for a pink rose. I managed to finish cutting the grass on Saturday afternoon. It took about an hour and it felt good to be outside in the moderately brisk fall afternoon. Most of the leaves are down, so they got mulched up by the mower. That means I won't have to rake or otherwise gather leaves from the lawn. I think that will be the last cut of the season. I didn't learn about the terrorist attacks in Paris until I woke up this morning and turned the computer on. I didn't have the television on at all Friday night, as I was reading until bed time. All is fine here, we're three hours from Paris. Ken is still in the US. It's a very terrifying and sad set of events. 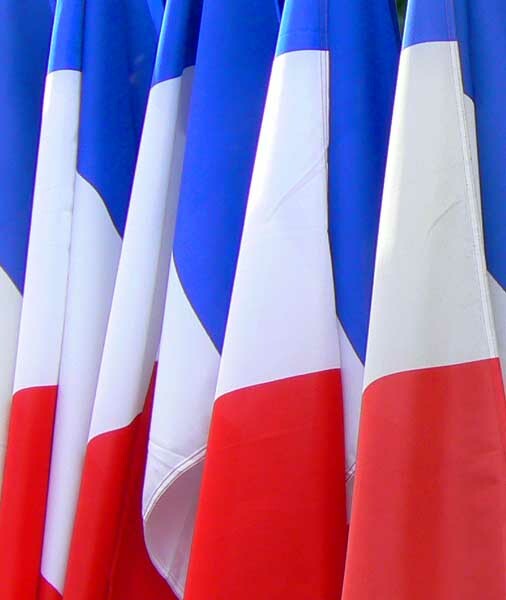 I'm hoping that those we know in Paris are safe and well. Not all the leaves have fallen yet. There are still plenty of hangers-on. I saw these in the woods where a path leads me and Callie down into the river valley, our normal evening walk. They're in a spot that was cleared for firewood last year. Since then, saplings and other growth have sprung up in the newly sunlit bare patch. It won't be bare for long. Saplings in the woods. 50mm, f/7.1, 1/125s, ISO 6400. In a burst of unplanned ambition, I got the lawnmower out yesterday afternoon and cut a portion of the yard. 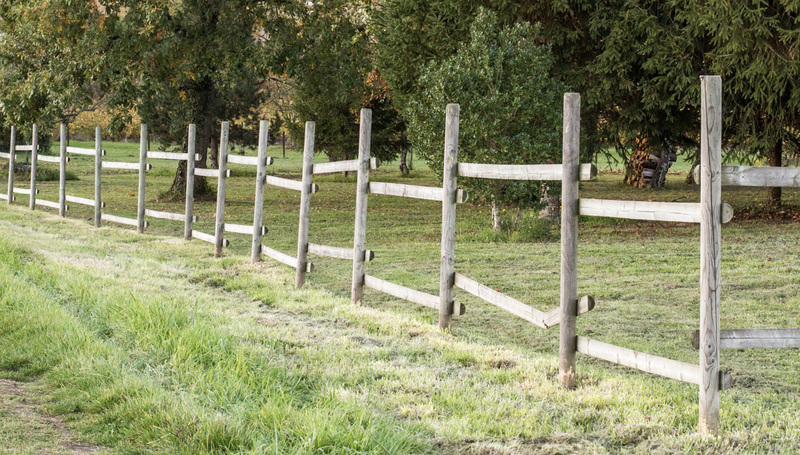 My intent in the sunny afternoon was to trim the strip outside the fence that runs along the north side of the property, something that takes less than five minutes. But then I thought, while I've got the mower out, I might as well cut the grass outside the hedges, too, and the strip along the road while I'm at it. Then I thought, it's silly to cut the grass outside our property and not do any inside, so I cut a section of the lawn. I didn't do it all because there are mole hills to clear in the other section first. I wasn't feeling that ambitious. Our Indian summer is fading into memory. Fall is tightening its grip. 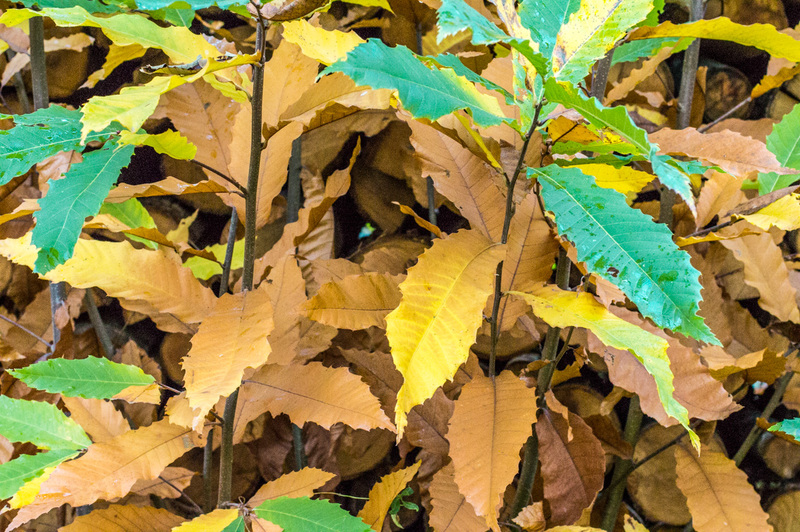 Temperatures are tumbling, and once golden leaves lie like brown shadows on the ground under their trees. Vineyard workers are busy replacing stakes and old vines. They are renewing certain parcels with tiny vines planted in sleeves to protect against the coming winter, filling in gaps where older, diseased vines have been pulled up. The rhythm of vineyard work beats on year 'round. A small apple tree braces itself for winter next to an old vineyard storage shed. I enjoy watching the changes each year, and even as I know that winter's cold and darkness are fast approaching, I also know that lighter and warmer days will follow after that. I've lived where the changes are more pronounced, where winters feel arctic and summers suffocating. I've lived where the temperature stays nearly the same all year. I prefer this to either of those. It's rarely too hot, rarely too cold. Whatever time of the year it is, whatever the changing weather brings, it usually feels the way it ought to. I raked the leaves off the driveway on Sunday. Bert watched me from up on the deck the whole time. Did he lift a paw to help? Nope. He did yawn a time or two. Perhaps I was boring him. The mornings are chillier now and are predicted to get even chillier as the week goes on. It's starting to feel more like fall. I guess our Indian summer is coming to an end. Well, it had to happen. 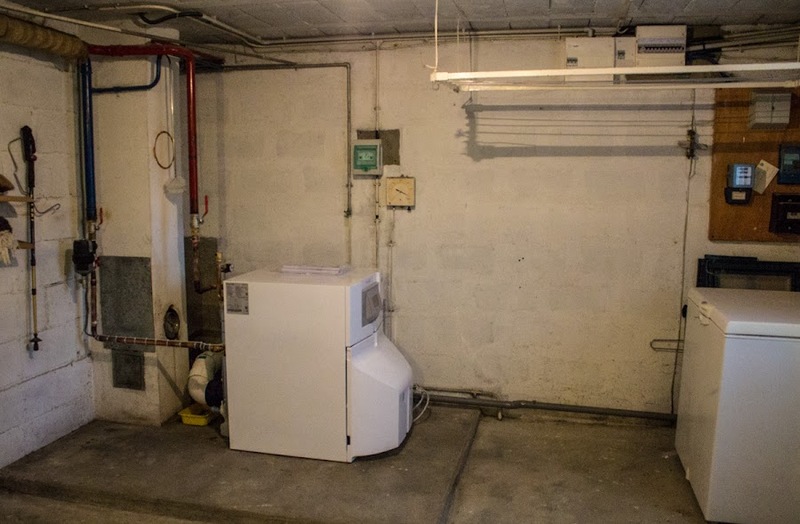 The new boiler for the central heat is supposed to be installed two weeks from today. I'm looking forward to that. I picked these from the vegetable garden this past weekend. I was surprised to find them this late. 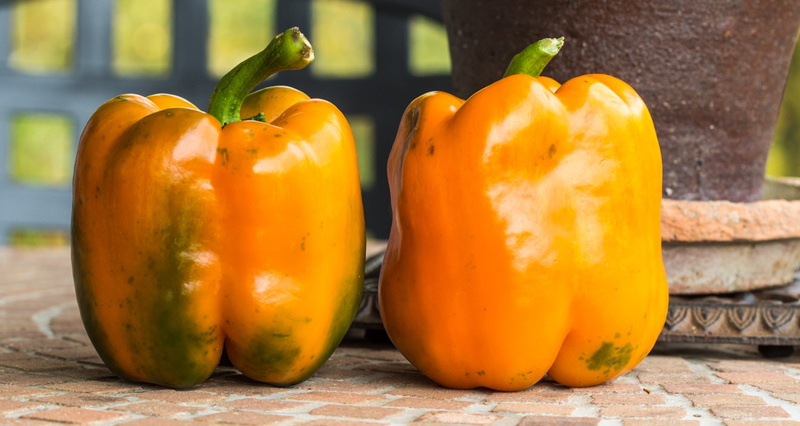 I knew there were some small peppers left on the plants, but I assumed they had either rotted or been eaten by slugs. But these got large and are in good shape. Now I have to do something with them. Orange/yellow bell peppers from the garden. Our temperatures are a little lower than they were over the weekend, but it's still pleasant. I like Indian summer, but I'm hoping that we have a real winter this year. And while I'm not fond of being cold, I know we need some cold weather and a freeze or two. Now, when I say cold, I'm not talking the arctic chill that you North Americans and Scandinavians know. Our climate is far too temperate for that. Thank goodness. I guess we're having Indian summer, or as they say in France, l'été de la Saint-Martin. Nearly every day of the year is the feast day of one saint or another in Catholicism, and Saint Martin's day is this coming Wednesday (which is also Armistice Day, a national holiday here). When the weather is good on the days surrounding the 11th, it's called Saint Martin's summer, or what we in the US would call Indian summer. 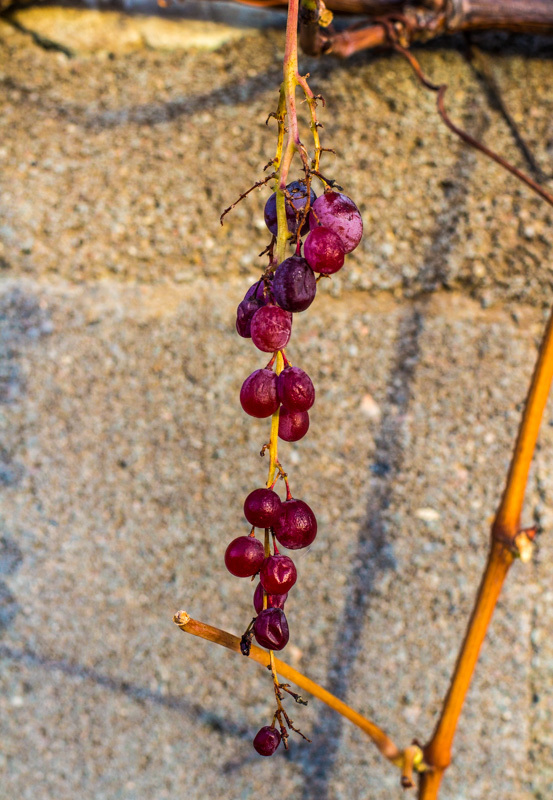 Hangers-on, turning into raisins on the vine during this dry, warm Indian summer. 100mm (macro), f/8.0, 1/320s, ISO 5000. The term l'été indien (Indian summer) is not unknown in France. 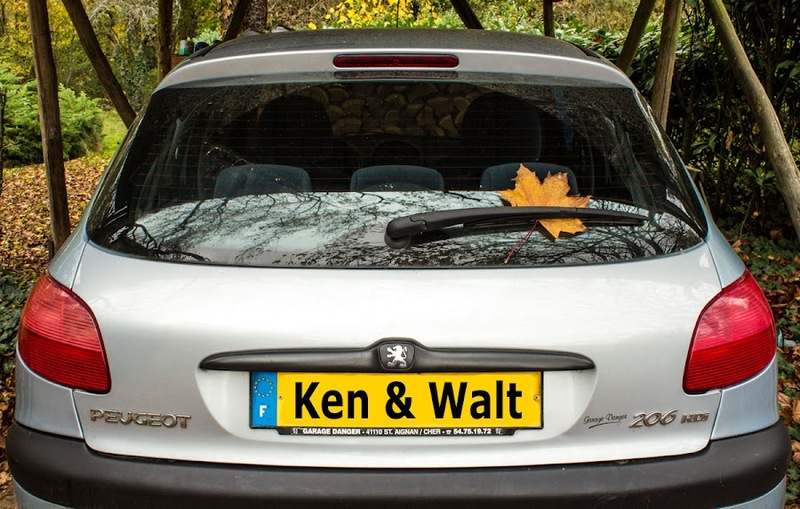 It's the title of a famous 1975 hit song by the late Joe Dassin, an American-born singer who had a successful career in Europe, most notably in France. He died in 1980 from a heart attack at the age of 41. That's the first thing I thought when I saw this on Friday, although I'm not sure what the offense was. I got the camera out, of course. I still have not raked the leaves that fell on the driveway because they're too wet, but I did rake a bunch out on the back walkway. They fell from out of the linden tree. The walkway gets more sun during the course of the day, so they were dry. Now they're all piled up in the vegetable garden. We had a high temperature of 22.3ºC (72ºF) on the deck Saturday. Tee-shirt weather! Now that's a personalized license plate! I also got the garden hoses rolled up and put away for the winter. Well, the two that run along the walkway to the vegetable garden. I won't be needing those any more this year. Two other hoses will stay out for a while, if not all winter. One hangs outside the back door and the other hangs near the garage. They come in handy for rinsing planting pots and the car. They're not likely to freeze up against the house unless it gets very cold. Then it's a quick job to bring them in. I've been watching the Paris Open Masters tournament all week. Today is semi-finals day with the final on Sunday evening. I'll wager Djokovic will dispatch Wawrinka, but I wouldn't predict Ferrer v. Murray. That should be a slugfest! I've heard of "The Hunger Games," but I've not read the books, so I probably won't watch the movies. This one's from New Zealand. Even the Kiwis can make bad films. The French title means "The Buried Heart," but the film's actual title is "Cave In." Le cœur enseveli (Cave In). New Zealand made-for-tv movie. Directed by Rex Plano, 2003. With Mimi Rogers, Ted Shackelford, and Bruce Allpress. ► A police commissioner calls on her experience to help four miners trapped underground. This little disaster film totally sacrifices the potential of its spectacular story in favor of the conventional and the bland. Two ways! Way one: today's 50mm photo. Way two: the temperature this morning is 59ºF (15ºC). That's pretty darned mild for a November morning. And our high temperatures over the weekend are expected to reach 70ºF (low 20sC). Home on the range, 50mm f/8.0, 1/125s, ISO 1600. I took advantage of yesterday's sunny day to wash the windows in the living room, meaning the big sliding glass doors that open onto the deck. That also meant taking down the curtains and washing them. I told you that I'm in a fall cleaning mood. Little by little, I'm working through the projects on my list. I really should go out today and rake the leaves out of the driveway. We shall see. Well, woods is more like it. There are forests around, but we live among the vines, so we have patches of woods here and there. The bigger forests are not far. I can see part of the Forêt de Gros Bois across the river valley from us when I'm walking in the vineyard. The Forêt de Brouard is just to our south. 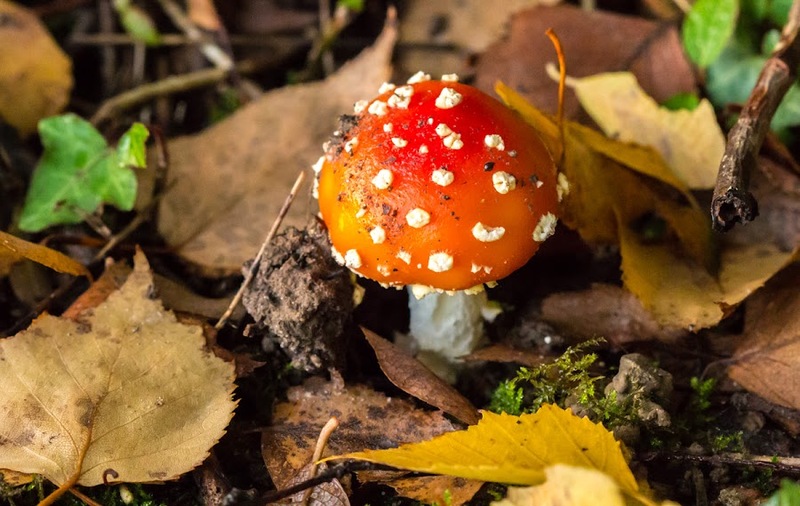 This mushroom is called amanite, and is quite toxic. Don't eat them! Some of the patches of woods around us also have names. Closest to us is the Bois des Vaux where Callie and I sometimes walk. She's chased animals in there and that's where we encounter the stuffed clothing nailed to the trees. Spooky. I think that the difference between un bois and une forêt in French is pretty much the same as between woods and forest in English; it's a matter of size, the former being much smaller in area than the latter. Be they woods or forests, they're not wild places but almost meticulously managed for wood. In forests, paths and roadways are well maintained and hunting blinds can be seen at regular intervals. Forests and woods are refuges for game like deer and wild boar. Except, of course, during hunting season. Here's a case where an accent mark makes a difference. The word forêt, with the circonflexe over the "e" means forest. Without the circonflexe, it's foret which means drill bit. The words are pronounced exactly alike, your only clue to their difference being their gender: it's une forêt but un foret. I got the call yesterday. We signed the order back in mid-July, now our new boiler has finally arrived. We were expecting it toward the end of September; production delays kept that from happening. But it's here now. Installation will happen in three weeks. It's this year's Christmas present to ourselves. 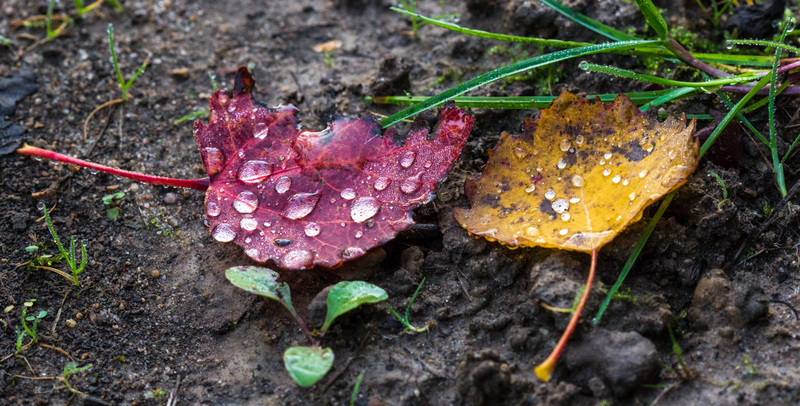 Water droplets on fallen leaves. The boiler heats water for the house's central heating system. The current one is twenty-three years old. It's working but we don't know for how much longer. It gets annual maintenance, but the parts are wearing out. The old pump unit needs CPR every now and then, and the control panel is shot. We have to turn the heat on and off manually; there is no thermostat in the house. All of that will change, supposedly, with the new unit. We thought it would be better to replace the boiler now rather than wait for it to break down in the middle of a cold winter. The new unit will have a remote-controlled programmable thermostat unit inside the house. No more going down into the utility room to turn the heat on every morning, then having to remember to turn it off before the house gets too hot. The new boiler will also come with a new pump. It should use significantly less fuel oil than the old one (let's hope Volkswagen wasn't in charge of the fuel usage stats). It's a condensing unit, meaning that the heat going up the chimney is captured and transformed into heat for the house. And, for all that, current law lets us get a nice percentage of the boiler's cost back in the form of a tax rebate next year (that law expires in December). We also get a free year on our maintenance and emergency service contract. I'm keeping my fingers crossed that all goes smoothly with the installation and that the thing works as promised. I'll keep you posted, of course. A weather system is moving through from the south bringing us rain today. I heard some on the roof early this morning. Apparently they're having a serious storm down on the Mediterranean coast with high winds and rain. We're not getting anything that serious here, and since the rain is coming from down south, the air is relatively warm. 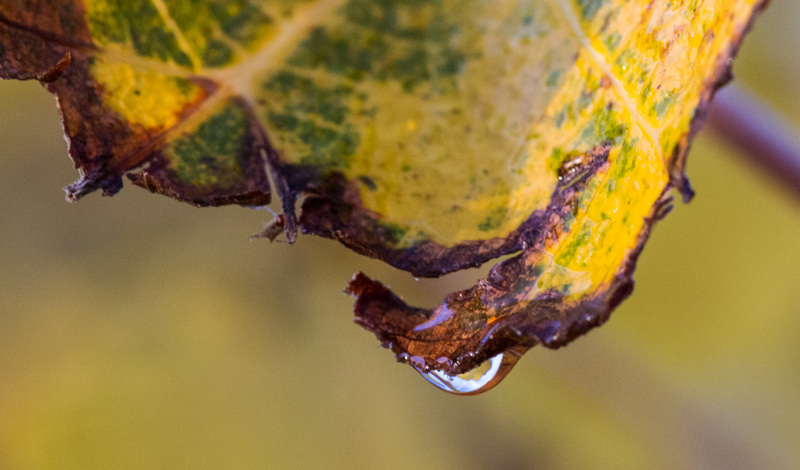 A dew drop clings to a grape leaf in the early morning light. I washed the windows in the kitchen on Monday. I'm planning to do the living room windows one day this week, while it's still warm. I guess I'm in a fall cleaning mode. I have a list of little projects I want to get done before the cold weather arrives. One of them is planting bulbs outdoors, so that will have to wait for the rain to clear off, which it is supposed to do after today. But there are some things that I've been saving for a rainy day and, well, here it is. We're having very nice weather for November. It's not quite "indian summer," but it's also not cold and rainy. I was able to sit out on the deck a little on Sunday afternoon; Bertie liked that because he likes to snooze on my lap when I'm out there. Our mornings are a little foggy and damp but who cares with afternoon highs in the upper teens (high 60s F). 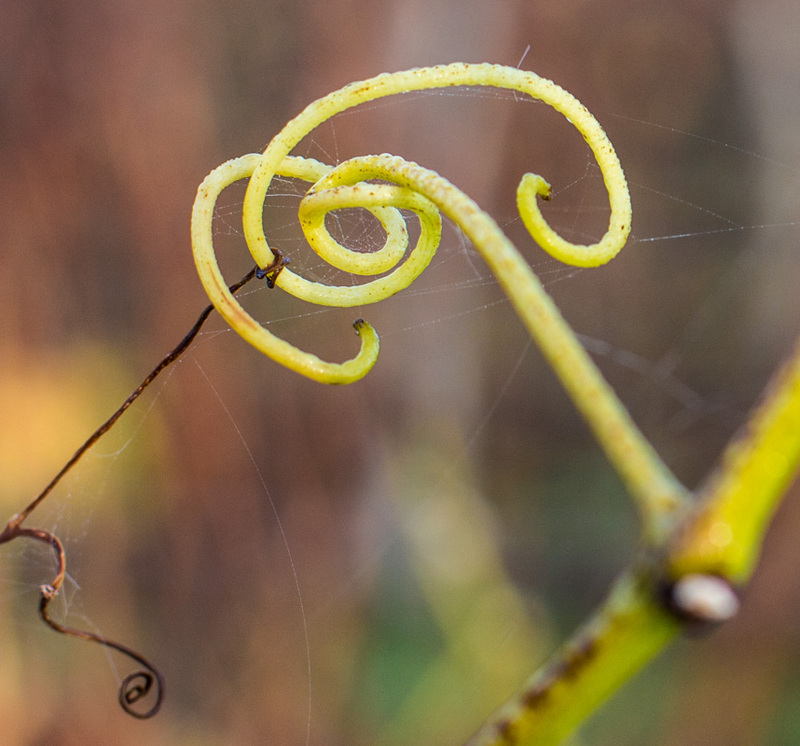 Grape vine tendril and spider's web, 100mm (macro) f/8.0, 1/320s, ISO 2500. The spider webs are covered in pearls of dew each morning, making them quite visible. I saw this semi-circular web stretched between two grape vine branches along a support wire. There was no sign of the spider who made it. A few weeks ago a tractor plowed up the field down below our hill and the farmer planted his crop of winter wheat. Now it has begun to sprout. The plants will stay fairly small through the winter, but in spring they will grow tall and make seed heads. One of our neighbors had a party last night. I heard the boom-boom of their music as late (early?) as three this morning. 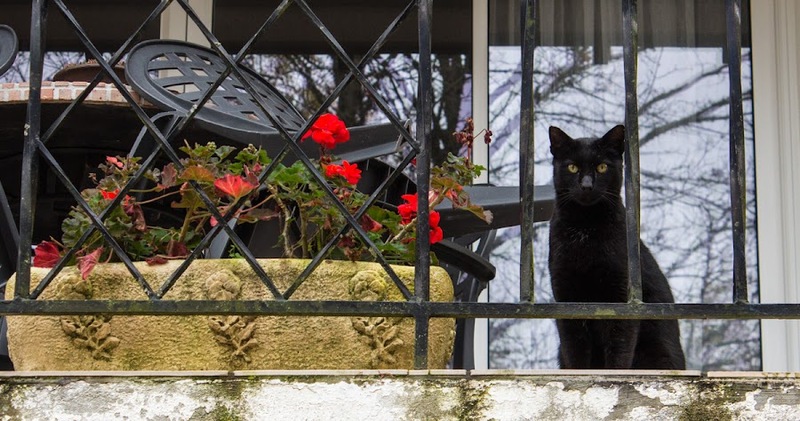 We heard people talking outside the house through the night, and car doors closing with bizarre regularity (but I didn't hear any cars start up or drive by). They didn't make enough noise to bother us, mostly because it's not warm enough for them to be outdoors partying. But we certainly knew they were there (and still are at 6:30 this morning).